Nathaniel Niles (1741-1828) was a Revolutionary War patriot and author of the popular ode "The American Hero," written in celebration of the Battle of Bunker Hill. The West Fairlee Center Church, constructed in 1855 and intact, is significant because it typifies many of the characteristics of the Greek Revival architectural style. It is also significant in that members of its early church community, such as Nathaniel Niles, played important roles in the formations of the state and nation. The Greek Revival style was popular in Vermont from the 1830s to the 1870s. As a landmark in the small village of West Fairlee Center, birthplace of the Town of West Fairlee, the church embodies much of this style. Church buildings in nearly every Vermont town shaped the architectural character of the state and are among the most prominent buildings in the community, often situated in central locations. The West Fairlee Center Church sits on a small lot facing a diminutive triangular green in the center of this rural village. Town settlers often elected to model their churches after those with which they were familiar from their home states, mainly Massachusetts, New York and, as in the case of West Fairlee Center, Connecticut. Churches reflect patterns of settlement, population growth and decline, and economic trends while documenting important passages of life—baptism, confirmation, weddings, and funerals. While their primary use is religious, they also serve as sites for other events such as concerts, festivals, and suppers. They are not only local landmarks but overall they are a significant part of Vermont's image and an attraction for out of state visitors. West Fairlee Center is a hamlet in the Town of West Fairlee, formerly part of the Town of Fairlee, Vermont. Under the charter of 1761, obtained from Governor Benning Wentworth on behalf of King George of Great Britain, Fairlee was part of the New Hampshire Grants. Meanwhile, the British Colony of New York was asserting its authority and dividing the territory west of the Connecticut River (now the State of Vermont) into four counties. Fairlee inhabitants called themselves residents of Gloucester County, New York but held their town meetings across the river in Orford, New Hampshire.Subsequent to Vermont's independence in 1777 and its admission into the Union in 1791 the legislature split Fairlee into two separate towns in 1797, namely the Town of Fairlee and the Town of West Fairlee. Twelve years later, the West Fairlee Center Church was founded by six people, three of whom were men. 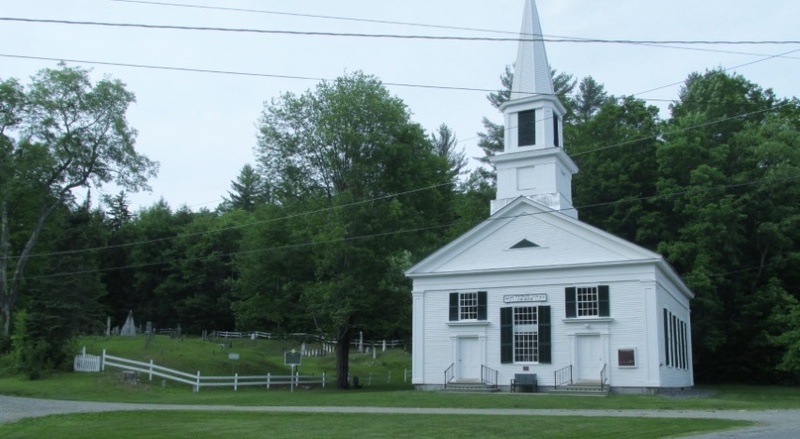 In 1811 their first building, a combination church/meetinghouse, was built. This meetinghouse, or Town House as it was called, was a two story log building located on a knoll just above the site of the present church. Early photographs show the present church, the meetinghouse behind it, and the former parsonage, called Shady Nook, to the east on Marsh Hill Road. It lies adjacent to the congregation's woods that supplied logs for heating the parsonage. This first building served the growing congregation until 1854 when, feeling the need for a new meetinghouse and church, sessions were held in the old meetinghouse to determine style selection, fund raising, and congregational participation. A controversy arose regarding the site for the new building. While some communities debated a church site with preferences for the town center versus mill locations, West Fairlee Center discussed whether to locate it on the west or east side of Middlebrook Road. A vote ensued in which the west side proponents were asked to sit on the west side of the meetinghouse and east side advocates sit on the east side. Twelve favored the west and six the east.5 The resultant structure was erected at a cost of $2,000. The West Fairlee Center Church closely resembles the Methodist Church (circa 1855) in West Fairlee Village. Many local people believe both churches were built by the same person, perhaps from an available set of plans such as those designed by Asher Benjamin. He published pattern books, including The American Builder 's Companion in 1827 and The Builder 's Guide in 1839, that embraced the Greek Revival style and provided construction and design guidelines to assist rural builders who may have had little exposure to good standing examples for churches and other buildings in their remote locations. There is, however, no assurance of this supposition. 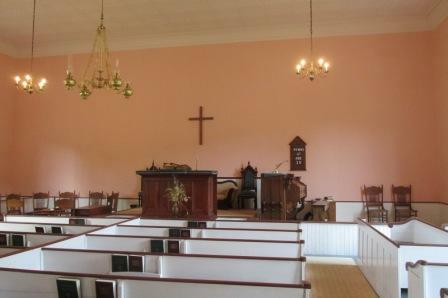 During the period between the founding of the church in 1809 and its first building two years later, religious services were held in the home of and often conducted by Nathaniel Niles (1740-1828) who was considered the founder of The Town of West Fairlee after the split with the Town of Fairlee. He also preached occasionally in the new meetinghouse when it was completed. His home, now known as Elmwood Farm, is less than one-half mile south of the present church. 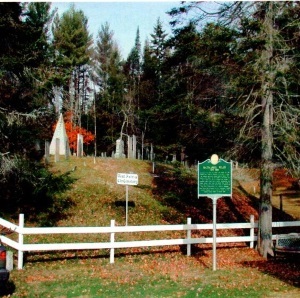 Because of his connection with the early church and his prominent burial site in the town cemetery next to the church, Niles is considered one of the most distinguished members of the church's community. Niles was a man of many talents, having attended both Harvard and Princeton as a student of law, medicine, and theology. He taught in New York City, preached in Connecticut, was an inventor, and one of the first two Representatives to the United States Continental Congress when Vermont was admitted to the union in 1791, serving there until 1795. He was also a talented poet, publishing a poem in the Connecticut Gazette just after the Battle of Bunker Hill. The poem was set to music and almost universally sung in the churches of the eastern states and became the war song of the New England soldiers. Aside from other talents, Judge Niles, as he was familiarly known, was politically astute. He served as a State Supreme Court Justice, member of the State Constitutional Convention, and he was chosen six times as an Elector of the President and Vice President of the United States. He was elected to the State Legislature in 1784 and served 1803, 1804, 1805, 1806, 1807, 1812, 1813, and 1814. In 1800, three years after the split with Fairlee, the Town of West Fairlee had a population of 386. By 1830 it had reached 656 and in 1850 it receded to 575. Conversely, the village of West Fairlee Center was growing. Being in the approximate geographic center of the Town of West Fairlee and an area of streams and fertile farmland, the village prospered with a meetinghouse, school and a general store. Its growth was further evidenced by the increase in its church membership to 148. Around 1865, the Vershire Copper Mine opened about one and one-half miles from West Fairlee Center. Consequently, the village's population dropped as many residents moved over the ridge to the village of West Fairlee that was adjacent to the mining activities. This resulted in growth and prosperity for the village of West Fairlee and it, became the business center for the town and ultimately the seat of the town government. Meanwhile the village of West Fairlee Center lost most of its business and church membership gradually decreased to forty by 1894. West Fairlee Center's interests in the mining operations were merely the supplying of fresh produce from its fields since the crops in the West Fairlee Village area were stunted by the pollution from the mines. Unfortunately, the Ely Mines, as they became known, were eventually abandoned and West Fairlee village lost its wealth and much of its population as had West Fairlee Center previously. Today the only two buildings of note in West Fairlee Center, from that era, are the West Fairlee Center Church and the Nathaniel Niles homestead. Perhaps the diminished membership and the corresponding benign neglect of the church served to preserve the building. Old photographs of the church, shortly after its construction, are perfect representations of it as it appears today. The parsonage disappeared, the general store is a private home, the brick schoolhouse is now a community center and many houses are gone. The Town House was razed in favor of a schoolhouse that is now a private home. The church, however, remains intact and is still the magnet for many of those who have roots in the village. Although regular services have not been held for decades, the church continues to offer a series of multi-denominational vespers services every summer. It is also used as a meeting place and hosted the meetings that resulted in a large number of old farms in the Middlebrook Valley entering conservation programs with the Upper Valley Land Trust. Secular meetings are occasionally held at the church and it has been the setting for a number of weddings, funerals and baptisms over the past few years. The small but classic Greek Revival building remains the visual hub of the community. The church or meetinghouse, is a tangible symbol of the village—just as in the days of Nathaniel Niles.